Fizz comes from a long line of show dogs, of fluff and pamper companion dogs. There has never been a working dog in the family. So Fizz’s determination to try out at the Sunnyvale City Police Station to be a police dog, is a surprise and a concern for his family. Fizz is brave, clever and super-fast – perfect police dog material. He is also small and fluffy – unlike Amadeus, who wants to be top dog. Before either of them, or any of the many other applicants, can become a police dog, they must successfully complete a number of trials. 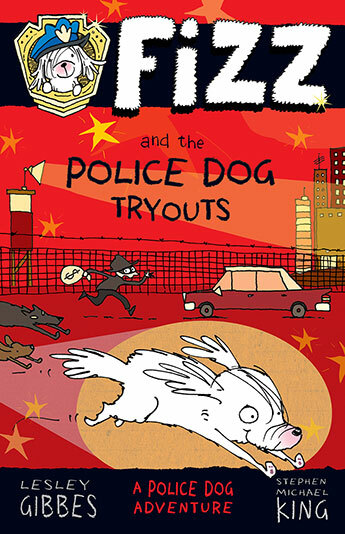 ‘Fizz and the Police Dog Tryouts’ is the first of four short chapter books about Fizz. Each opening includes black and white illustrations. Chapters are listed at the front and each chapter includes a full-page illustration and title. Perfect for newly confident readers making the transition from fully-illustrated texts to longer stories. Fizz might be small and fluffy, but he knows what he wants and is happy to work hard to succeed. Look out for clever character names and puns.